Assassin's Creed Odyssey's DLC trophy is also being renamed to be less offensive. Spoilers for Assassin's Creed Odyssey and its DLC to follow. 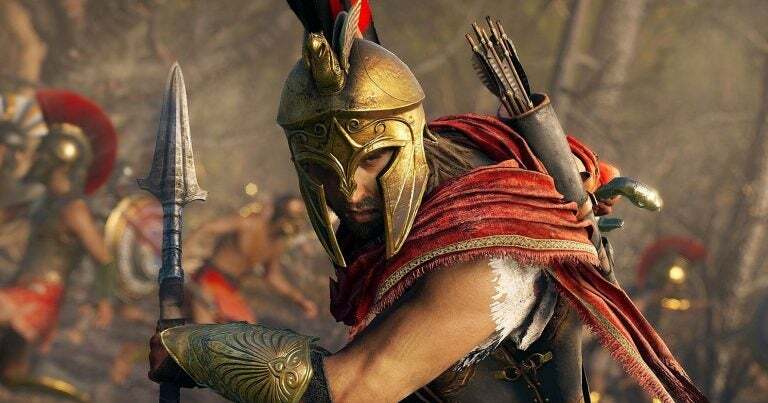 Assassin's Creed Odyssey's Creative Director Jonathan Dumont says players' response to the Shadow Heritage DLC has been a "learning experience" for the developer. The ending of Legacy of the Blade's second installment is seen player-tunneled into a heterosexual relationship resulting in a baby, regardless of their actions and choices in the main game, or its DLC. Ubisoft's initial response was to assure players that the third episode would explore "the motivation behind this relationship," adding that it is part of a "set story." Since then, a second statement has been released (via Kotaku) in which Ubisoft admits it "missed the mark, "underestimating players' attachment to the game's protagonists.
" Reading through player responses of our new DLC for Legacy of the First Blade, Shadow Heritage, we want to extend an apology to players disappointed by a relationship your character partakes in. The intention of this story was to explain how your character's bloodline has an impact on the assassins, but looking through your responses it is clear that we missed the mark. "Alexios / Kassandra realizing their own mortality and the sacrifice Leonidas and Myrrine made their legacy alive before, felt the desire and duty to preserve their important lineage. Our goal was to let players choose between a utilitarian view of your bloodline lived on or forming a romantic relationship. " " We tried to distinguish between the two but could have done this more carefully than we were walking in a narrow line between The role-play choices and story, and the clarity and motivation for this decision were poorly executed. If you do not want to engage in a lasting romantic relationship if you do not want to. " 1; Growing Up – implied that not having a child or being gay made them less of an adult. "It was definitively not written with that intention. "We were the frustration of players who found this offensive and the achievement / trophy name will be changed when DLC 1.3 patch is available." Be sure to check out our review of the first episode of the DLC, Hunted, as well as the most recent episode at the center of the controversy, Shadow Heritage.